NOTE: Any book order placed from Feb. 15 until May 3, 2019 will not be shipped until May 3, 2019. Thank you. Fly Patterns of Yellowstone, Volume 2 A compendium of essential Yellowstone fly patterns. Co-authored with Craig Mathews, this book is full of fishing tips, tying instructions for all the patterns, plus black/white and color photographs of all the flies. These are the patterns we fish with, and we think you’ll find them as productive as we have. All the flies have uses outside the Yellowstone region. Hardback. $24.95. Makes a great gift for any fisherman or fly tier! To purchase a copy, click on the book image. PayPal and all major credit cards accepted. Fly Patterns of Yellowstone, Volume 1 Out of print. Copies are readily available on Amazon and sometimes on Ebay, as well as from the rare book dealers. Fishing Yellowstone Hatches Out of print. Co-authored with Craig Mathews, this book is also available on Amazon and Ebay. 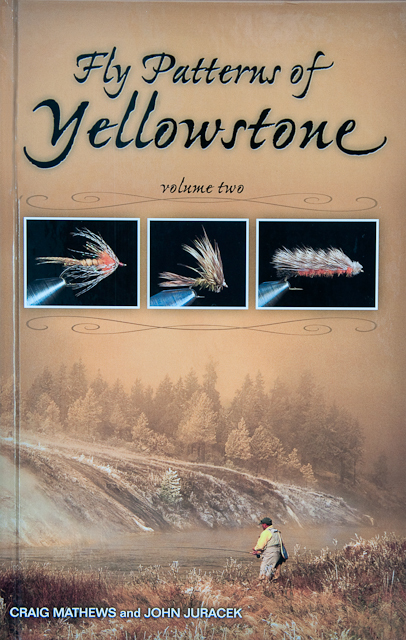 This volume covers all of the important hatches in the Yellowstone area (which is equivalent to most of the West as far as fly species, so this book is widely useful). It provides detailed information about the insects, fishing strategies, and fly patterns. Photographs of all the insects are included. One of the most valuable fishing books that exists for fishing the Yellowstone area. Yellowstone: Photographs of a Fly Fishing Landscape Out of print. As the title suggests, this is a book of angling landscape photographs published in 2002. The book publishing industry was falling on hard times after 9/11, and as a consequence the press run of this volume was limited to a couple thousand copies. It was out of print by the following year. If you are lucky enough to own a copy, hang on to it. Copies are available on Amazon, though quite expensive.